Discerning the Mystery: CBS News is in Antarctica for a Series of Disclosures on... "Climate Change"
The corporate media has told us that these Antarctic expeditions by political officials and public personalities involve nothing more than curiosity about a melting ice sheet. However, this explanation does not make any sense, in my observation. This point has been made by many people, and I tend to agree. There is no reason for so many high-profile individuals to fly down to the Antarctic to watch ice melt. Moreover, the Secretary of State does not typically fly to this wasteland a week before the presidential election for such a purpose. The usual scientific research team and high-res digital camera typically suffices for this situation. According to numerous credible sources, something significant is going on in the Antarctic, and it is only a matter of time before we see mainstream acknowledgement of the truth behind these stories (or at least a portion of it). In a previous article, I covered the disclosure of the planetoid Ceres and how NASA's entire Dawn mission was surrounded by some very interesting disclosures about the possibility of extraterrestrial life. It was almost as though NASA had more to say about this planetoid than their official reports revealed. Like Antarctica, there seemed to be a bigger reason as to why the mission to Ceres was launched at the time it was. It may be that certain parties already know what is to be reported by the corporate media on Antarctic—similar to the situation on Ceres. However, this is only a possibility at this point. As previously stated, the situation has shown to be much more significant than official reports reveal. For now, we will simply acknowledge the limited amount of information that CBS has to offer. However, we may look forward to more forthright disclosures in the very near future, granted we demand to know the entire truth surrounding these cryptic reports. Phillips also described a “chill in the scientific community that’s working [in Antarctica]—a fear that the kinds of money they need for their work will be less forthcoming in the future and that there’ll be a less sympathetic ear in government for the kind of science they do.” Many scientists have expressed grave concerns about the future of climate science under President Donald Trump, who has dismissed climate change as a “hoax” and whose administration may “attempt to undermine the years of science underpinning” climate policies, as Time magazine put it. In the segment, Phillips accompanied Palmer Station scientists tracking and studying sick and malnourished killer whales. Phillips explained that the scientists so far only have a hypothesis for why the whales are in bad health, but they believe that warming waters—which have reduced the pack ice and led to fewer seals in areas where the whales normally hunt—might be to blame. 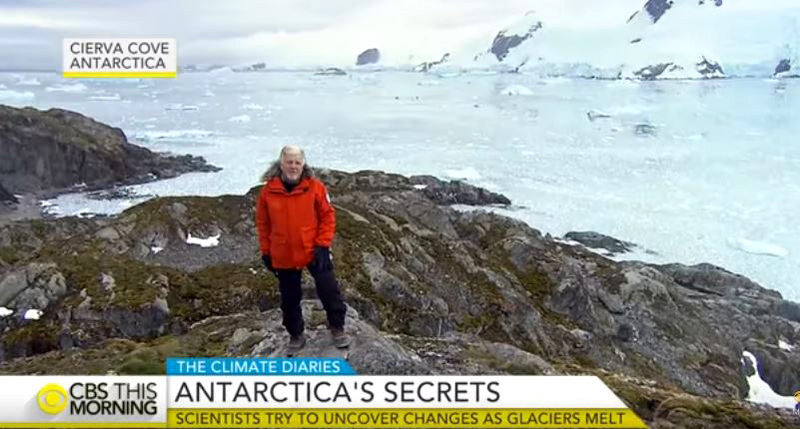 In Phillips’ reports on the February 15 editions of CBS This Morning and CBS Evening News, researchers at Palmer Station detailed how dramatic changes in Antarctica are impacting another animal found in the region—the Adélie penguin, whose population on the island housing Palmer Station has declined by around 85 percent, from a peak of almost 9,000 to about 1,200 this year. As Phillips explained in the CBS This Morning report, “These Adélie penguins need one essential condition to thrive: they need sea ice to hunt from, and there is less of that around now,” with the sea ice season now three months shorter than it used to be.